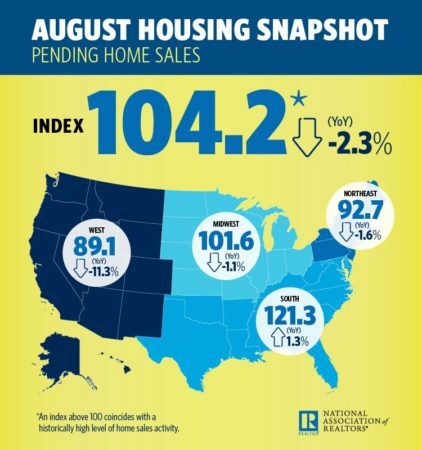 Pending home sales, in which a contract is signed but the sale has not yet closed, dropped 2.3 percent in August — the eighth consecutive month of annualized declines, according to the latest National Association of Realtors Pending Home Sales Index, released Thursday. Low inventory and rising home prices propelled the latest decline, pulling the Pending Homes Sales Index down to 104.2, from 106.2 in July, said Lawrence Yun, chief economist with the National Association of Realtors. The index is based on a national sample of approximately 20 percent of all existing-home sales transactions, which tend to mirror monthly sales-contract activity. Looking forward, Yun believes existing-home sales will decrease 1.6 percent to 5.46 million, and the national median existing-home price will increase by 4.8 percent. In 2019, existing sales and home prices will rise by 2 percent and 3.5 percent, respectively, Yun predicted. Beyond deteriorating affordability, Yun believes rising mortgage rates will pose a threat to pending home sales in the coming months as some buyers postpone home purchases. Damage from Hurricane Florence is expected to push September and October pending home sales down in the Northeast, predicted Realtor.com Chief Economist Danielle Hale. “The Carolinas made up 6 percent of all for-sale inventory in the U.S. before the hurricane touched down and we expect it to have a significant impact on the September and October sales reports,” she added. The West experienced the largest month-over-month and year-over-year declines at 5.9 percent and 11.3, respectively. The Northeast and Midwest experienced month-over-month losses of 1.3 percent and 0.5 percent, respectively, and year-over-year declines of 1.6 percent and 1.1 percent. The South, despite having a year-over-year decline of 0.7 percent, was the only region to experience a year-over-year increase of 1.3 percent.